It is well known that the α, β-unsaturated ketones are found as naturally-occurring compounds, which are widely used as intermediates for the synthesis of several types of heterocyclic compounds such as pyrazoles, isoxazoles, and fused heterocyclic derivatives which were of great biological interest especially as antimicrobials and antioxidants . The presence of unsaturated carbonyl system makes it biologically active . They exhibit diverse pharmacological activities such as potential cytotoxic agents, antimicrobial agents, antiviral, anti-inflammatory, anesthetics, etc . They are synthesized by Claisen–Schmidt condensation of aldehyde and ketone . The enone functionality present in them provides an attractive site for 1,3-dinucleophiles affording such heterocyclic ring-systems [5,6]. The photo chemical properties of the synthesized compounds were studied using UV-Vis and photominescenes spectroscopy. The same reaction was carried out in solvent free, microwave assisted method and the product yield was 91.6% (compounds) in 90s. The main objective of this work is to prepare various derivatives of some p-quinones in order to be examined against the wide spread diseases e.g. malaria, cancer, etc. which still cause death and disability throughout the world. Melting points were uncorrected and were recorded on melting point apparatus (Gallenkmp, England) by using open capillary tubes. IR spectra were recorded on FTIR spectrometer (Perkin Elmer model 8400 s) using KBr disc method. 1HNMR was recorded on (Brucker AMX 400 MHZ) spectrometer in DMSO as solvent and TMS as internal standard. (0.001 mole) of Benzylaldehye/Furfural/Anisaldehye/Salicyaldehyde and (0.001 mole) of p-aminoacetophenone were dissolved in minimum amount of alcohol i.e. ethanol. Sodium hydroxide solution (0.02 mole) was added slowly and the mixture stirred for 24 hours. Then it was poured in 20 ml of cold distilled water. The precipitate obtained was filtered, washed and recrystallized from ethanol. The completion of the reaction was monitored by TLC (Figure 1). Figure 1: chemical structure of synthesized isoxazoles. Yield 69.1%, m.p. 139°C-140°C, Rf value 0.97, mobile phase ratio chloroform 9.8:0.1 methanol. IR 1600.1 cm-1, 1629.74 cm-1, 1558.39 cm-1, 767.62 cm-1, 3342.41 cm-1, 3463.92 cm-1, 1172.64 cm-1. 1HNMR, 7.16-7.18 ppm (m,Ar-H), 3.46-3.87 ppm (s,2H-NH2). Yield 72.9%, m.p. 130°C-131°C, Rf value 0.85, mobile phase ratio chloroform 9.8:0.1 methanol. IR 1604.06 cm-1, 1637.45 cm-1, 1585.38 cm-1, 742.54 cm-1, 3328.91 cm-1, 3440.77 cm-1, 1187.48 cm-1. 1HNMR, 6.12 ppm (d,1H,furan), 7.46-7.84 ppm (m,4ArH), 3.32 ppm (s,2H-NH2). Yield 39.1%, m.p. 156°C-157°C, Rf value 0.85, mobile phase ratio chloroform 9.8:0.1 methanol. IR 1658.67 cm-1, 1596.95 cm-1, 1571.88 cm-1, 815.83 cm-1, 3336.32 cm-1, 1292.22 cm-1, 1172.64 cm-1. 1HNMR 4.27 ppm (s, 3H-OCH3), 7.78-7.79 ppm (m,4Ar-H), 3.80 ppm (s,2H-NH2). Yield 42.9%, m.p.152°C-153°C, Rf value 0.83, mobile phase ratio chloroform 9.8:0.1 methanol. IR 1643.24 cm-1, 1595.02 cm-1, 1569.05 cm-1, 750.36 cm-1, 3247.90 cm-1, 1342.36 cm-1, 1HNMR 6.66-6.95 ppm (m,4Ar-H), 4.59 ppm (s,1H-OH), 7.00-8.34 ppm (m,4Ar-H), 3.45-3.56 ppm (s,2H-NH2). The mixture of α, β-unsaturated carbonyl compounds, (I, II, III, IV), (0.01 mole), hydroxylamine (0.01mole) and sodium acetate (0.1 g, 0.001 mole) were dissolved in 20 ml of ethanol was refluxed for 6 hours. The mixture was poured into ice-water and stirred using the glass-rod until the precipitate was formed, 10% of HCl drops was added. The precipitate was filtered, washed and recrystallized from ethanol. The completion of the reaction was monitored by TLC. Yield 53.7%, m.p. 197°C-199°C, Rf value 0.87, mobile phase ratio chloroform 9.8:0.2 methanol. IR 1647.10 cm-1, 1591 cm-1, 805.98 cm-1, 3228.62 cm-1, 1564.16 cm-1, 3465.84 cm-1. 1HNMR 6.00 ppm (d,1H furan), 6.54-6.57 ppm (s,1H-isoxazole), 3.37 ppm (s,2H- NH2), 7.64-7.67 ppm (m,4Ar-H). Yield 57.9%, m.p. 189°C-191°C, Rf value 0.83, mobile phase ratio chloroform 9.8:0.2 methanol. IR 1662.52 cm-1, 1512.09 cm-1, 678.90 cm-1, 3203.54 cm-1, 1583.45 cm-1, 3417.83 cm-1. 1HNMR, 7.66-7.94 ppm (m,4Ar-H), 3.65 ppm (s,1H-OH). 6.61ppm (s,1H-isoxazole ), 7.66-7.68 ppm (m,4Ar-H ), 3.45 ppm (s,2H-NH2). Yield 69.2%, m.p.151°C-152°C, Rf value 0.76, mobile phase ratio chloroform 9.8:0.1 methanol. IR 1647.10 cm-1, 1541.02 cm-1, 752.19 cm-1, 3286.48 cm-1, 1683.74 cm-1, 3419.56 cm-1. 1HNMR 8.07-8.11 ppm (m,5Ar-H). 7.43 ppm (s,1H-isoxazole), 8.66-8.67 ppm ( m,4Ar-H), 3.61 ppm (s,2H-NH2). Yield 64.3%, m.p. 136°C-137°C, Rf value 0.78, mobile phase ratio chloroform 9.8:0.2 methanol. IR 1645.17 cm-1, 1515.94 cm-1, 671.18 cm-1, 3000 cm-1, 1677.95 cm-1, 3336.62 cm-1. 1HNMR 7.50 ppm (m,Ar-H). 3.22- 4.18 ppm (s,3H-OCH3). 6.40 ppm (s,1H- isoxazole), 7.90-7.99 ppm ( m,4Ar-H), 3.22-3.26 ppm (s, 2H-NH2). The mixture of isoxazoles (VI,VII,VIII,IX) (0.001 mole), and Bromonil (0.003 mole was dissolved in ethanol (10 ml), glacial acetic acid (10 ml), distilled water (2 ml) and (0.1 g) of sodium acetate was added. The mixture was refluxed for 3 hours. The mixture was poured into ice-water and stirred using the glass-rod until the precipitate was formed, 10% of HCl drops was added. The precipitate was filtered, washed and recrystallized from ethanol. The completion of the reaction was monitored by TLC. Yield 52.5%, m.p. 284°C -285°C, Rf value 0.79, mobile phase ratio chloroform 9.8:0.1 methanol. IR 1672.17 cm-1, 1639.38 cm-1, 1541.02 cm-1, 3336.62 cm-1, 703.97 cm-1, 1486.94 cm-1, 867.91 cm-1. 1HNMR 2.51ppm (s,1H-OH), 7.20- 7.80 (m,8Ar-H2 ring), 6.80 ppm (s,1H-isoxazole), 2.06-2.07 ppm (s,1H-NH2). Yield 62.4%, m.p. 253°C -254°C, Rf value 0.78, mobile phase ratio chloroform 9.8:0.1 methanol. IR1672.17 cm-1, 1639.38 cm-1, 1541.02 cm-1, 3336.62 cm-1, 703.97 cm-1, 1486.94 cm-1, 867.91 cm-1. 1HNMR 7.00-7.80 ppm (d,1H-furan), 6.90 ppm (m,8Ar-H), 6.50 ppm (s,1H-isoxazole), 2.51 ppm (s-1H-NH2). Yield 59.9%, m.p. 279°C-181°C. Rf value 0.74, mobile phase ratio 9.8:0.1 methanol.IR 1672.17 cm-1, 1564.18 cm-1, 3343.19 cm-1, 703.97 cm-1, 1496.66 cm-1, 867.91 cm-1, 1HNMR 7.20-7.80 ppm (m,8Ar-H), 2.80 ppm (s,3H-OCH3), 6.56 ppm (s,1H-isoxazole), 2.50 (s,1H-NH2). Yield 61.7%, m.p. 248°C-249°C, Rf value 0.70, mobile phase ratio chloroform 9.8:0.1methanol. IR 1672.17 cm-1, 1558.38 cm-1, 1541.02 cm-1, 3348.19 cm-1, 703.19 cm-1, 1458.08 cm-1, 867.91 cm-1. 1HNMR 7.80-8.80 ppm (m,8Ar-H), 6.40 ppm (s,1H-isoxazole), 2.50 ppm (s,1H-NH2) (Figure 2). 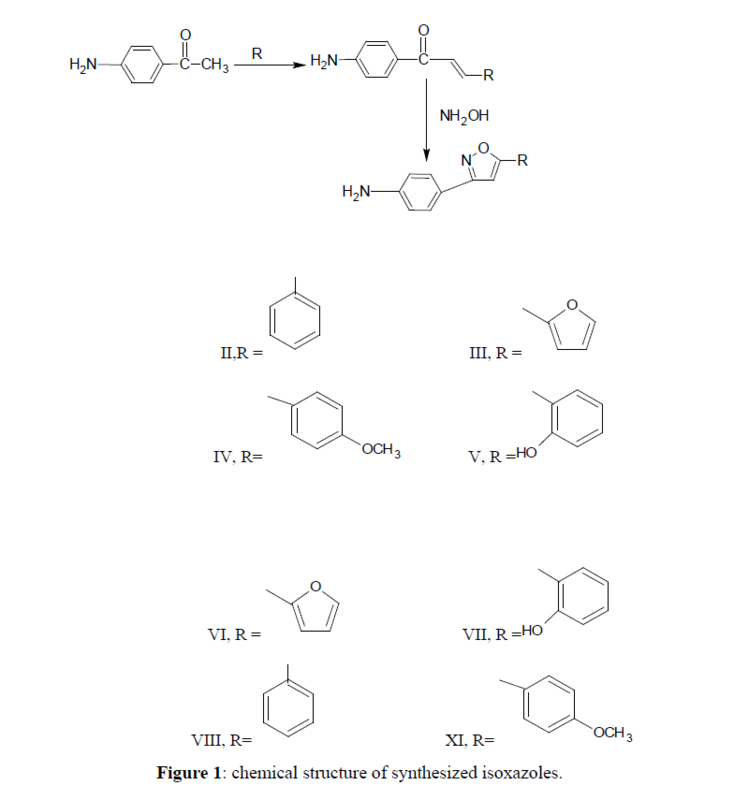 In this work, all the synthesized compounds were characterized by TLC, melting point, IR, 1HNMR and MS. Conjugate addition of carbon nucleophiles (i.e different aromatic aldehydes) to para-aminoacetophenone gave the α,β- unsaturated carbonyl compounds. These compounds are used as starting materials in the synthesis of hetrocyclic compounds e.g isoxazoles, quinolinones. They are important intermediates in many addition reactions of nucleophiles. They were synthesized by using Claisn-Schemdit condensation in the presence of ethanolic base NaOH, which on cyclization with hydroxylamine in sodium acetate in ethanol under reflux condition furnished the isoxazoles which on the hand treated with the quinone (bromonil) lead to the formation of the target compounds. 1HNMR of the synthesized p-quinones derivatives compounds (IX,X,XI,XII), is displayed as a singlet signal of one proton intensity of isoxazole at δ 6.80-6.40 assigned to the proton isoxazoles rings and the protons of the aromatic rings that appeared as multiplied intensity at δ 8.77-7.19 ppm. Compound (IX) contain the hydroxyl group located at the ortho position of aldehydic ring which showed at δ 2.51 ppm, due to hydrogen bonding with the greater downfield shift higher δ value of its resonance. Compound (X) contain the furan showed singlet signal at δ 6.90 ppm due to the proton and a doublet at δ 7.80-7.00 ppm due to the one proton of the carbon atom which is attached to the carbon atom. The compound (XI) contain the methoxy group at para position of the aldehydic aryl ring was displayed singlets of the 3 proton of the methyl group intensity at δ 2.078 ppm due to the lone pair effect of oxygen atom. Compound (XII) contain the benzyl group which appeared at the range δ 7.78 ppm due to the presence of the 5 protons of the benzene ring, and a singlet signal appear at δ 2.50 ppm due to the proton attached to nitrogen atom. The present work was clearly indicated that the synthesized p-quinones derivatives compounds can be prepared in good yield from the α,β-unsaturated carbonyl compounds as intermediates. They were prepared as newer compounds for their antitumor, anticancer, antimicrobial and antimalarial activities. The results indicate that in all the compounds, the yield of the synthesized p-quinones derivatives was of higher percentage. Jun Wu., et al., Asian Journal of Chemistry, 2014. 26: p. 7769-7775. Jalal Hasan Mohammed., International Journal of Chemical and Biomolecular Science, 2015. 1: p. 107-112. Kalirajan, R., et al., International Journal of Chem. Tech Research, 2009. 11: p. 27-34. Chetana, B. Patil., et al., Journal of Pharmaceutical Sciences and Research, 2009. 1: p. 11-22. Rajat Ghosh., et al., World Journal of Pharmacy and Pharmaceutical Sciences, 2014. 3: p. 578-595. Saeed, A.E.M., et al., African Journal of Pure and Applied Chemistry, 2009. 3: p. 275-280.